Park Forest, IL–(ENEWSPF)–April 2, 2017. 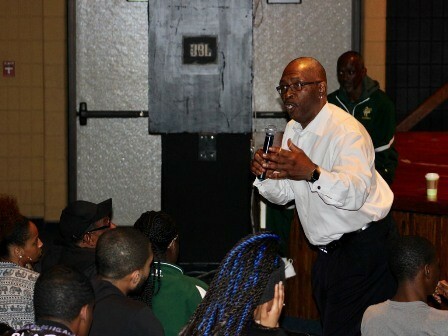 Recently, NBA legend Mark Aguirre, a close friend of Park Forest’s own Craig Hodges — also an NBA legend — visited Rich East High School. Hodges, the current boy’s varsity basketball head coach at Rich East also serves as a mentor and a guide for many student-athletes. Hodges invited Aguirre to speak to students at the high school. Aguirre’s message focused on discipline, hard work, goal setting, and critical decision-making skills. Aguirre and Hodges also discussed with students the importance of family and serving their community.